There will be no escaping Muse for the next couple of months. The London Olympics will be saturated by the strains of their official song, Survival, which will be played when athletes enter the Olympic stadium, before each medal ceremony and as the theme for all international TV coverage. The track was launched with an exclusive play on Radio One. 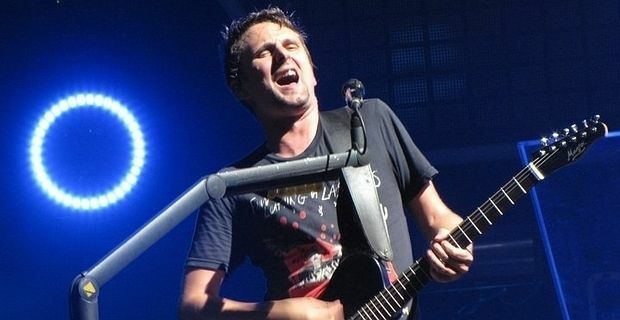 The band said the song had been written by Matt Bellamy, inspired by "total conviction and pure determination to win". The song is a powerful rock anthem, not a substantial departure from their customary epic and bombastic style, but the sheer scale of its exposure worldwide could lift the band to greater heights of international recognition. Their song will be augmented by four other official Olympic songs from Dizzee Rascal, The Chemical Brothers, Delphic and Sir Elton John. Muse were among celebrities to have carried the Olympic torch on its current procession around the UK, taking part when the flame passed through their hometown of Teignmouth in Devon. Muse are presently completing work on a new album, the follow-up to 2009's The Resistance. Bassist Chris Wolstenholme suggested that the new songs would be "radically different" from what had gone before. After their Olympics extravaganza, Muse head out on a UK tour, playing Glasgow's SECC on October 24, London's O2 Arena on October 26 and 27, Birmingham LG Arena on October 30 and Manchester Arena on November 1.